Focus on Travel News (FTNnews.com) is a reliable and balanced source of travel industry news and analysis. FTNnews started in 2002 as a weekly and became a daily in 2008. 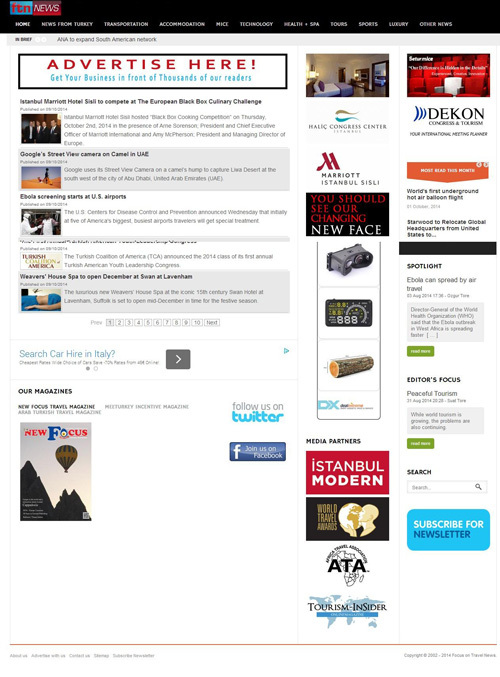 It is Turkey’s first English edition travel news website. FTNnews covers daily travel news from accommodation, aviation, cruise, MICE – Meetings, health & spa industries. Additionally travel and tourism news from travel agencies and tour operators and news from Turkish travel and tourism industry can be found at FTNnews.com. Every visitor to FTNnews.com views your banner. Your banner is not only shown at the frontpage but also with content that captures visibility of the largest possible number of visitors. Your banner’s location is not rotating, so that visitors of our site will have enough time to truly see it.